Based on the true story and book by Ron Hall, Denver Moore, and Lynn Vincent is the story of an international art dealer Ron Hall (Greg Kinnear) who must befriend a dangerous homeless man (Djimon Hounsou) in order to save his struggling marriage to his wife (Renée Zellweger), a woman whose dreams will lead all three of them on the most remarkable journey of their lives. Jon Voight plays Hall’s father, with whom he reconciles thanks to the revelations of his new life. Unfortunately, the music is so loud that I could not here the dialogue when viewing the trailer for this movie. However, this appears to be an emotional and uplifting movie from what I could tell. So disappointed it will not be opening in London. I was really looking forward to it. Is there a way to get it to open here? Laura, good news!! Same Kind of Different As Me will now be opening in London! You can see it at the Cineplex Odeon Westmount & VIP Cinemas. I hope you enjoy it! Can you try to get Fort McMurray’d Landmark Theatre to show the movie? Opens tomorrow un US. Do you know yet if it will be showing in London? Hi, Laura. Yes! 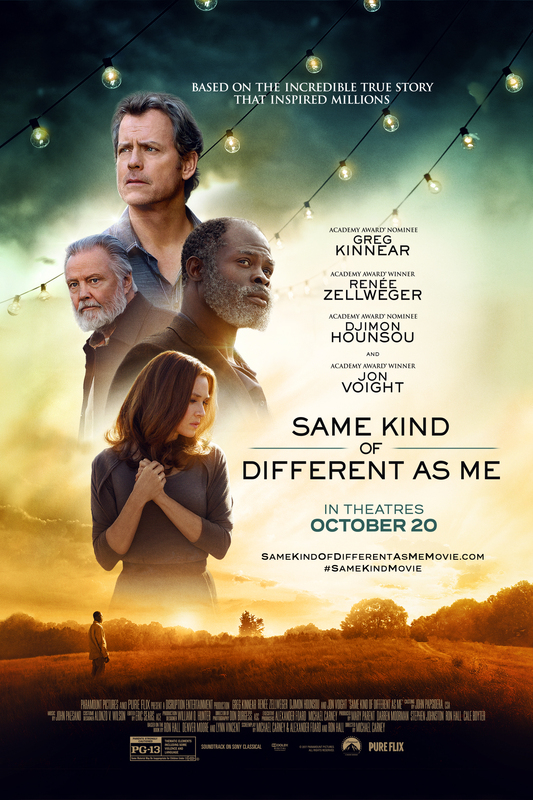 Same Kind of Different As Me will be playing at the Cineplex Odeon Westmount & VIP Cinemas in London, ON. I hope you’ll have an opportunity to see it! Unfortunately it is looking less and less likely as the movie is now near the end of it’s theatrical run; it might still find itself playing in a few independent theatres now.